Walter Albert Yeulett was born on 2nd June, 1899, in Walton-on-Thames, Surrey. 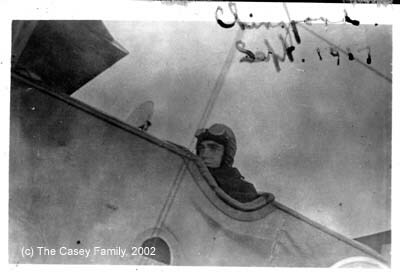 His sister (May) would go on to marry Charles Casey and become my Grandparents. 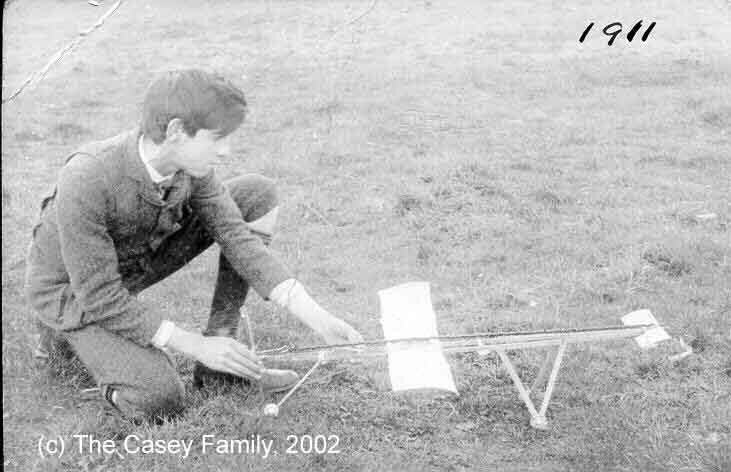 Walter, or "Toby" as he was known to the family, had taken an interest in aviation at a very young age and when 12 he was designing and building his own model aircraft as illustrated by the picture on the left taken in 1911. There's a nice story surrounding this model which you can find towards the bottom of the menu on the left. He attended the Tiffin Boys School in Kingston-on-Thames leaving in 1915 to pursue his interest in aviation and at the age of 17 was a student engineer with Gordon Watney aero-engines in Weybridge, Surrey. Having gained workshop experience in the construction of aero-engines he was working in the firm's drawing office when, at the age of 18, he joined up with the Royal Naval Air Service on 22nd July 1917 as a Probationary Flight Officer. As with most RNAS recruits Toby initially went to RNAS Crystal Palace (then often referred to as HMS Crystal Palace whilst officially being HMS Victory VI) where he would have had his basic training including the inevitable square bashing, PT and overall induction into the Royal Navy. "HMS Crystal Palace" was run very much as a serving ship so the recruits would quickly become familiar with the ways and traditions of the Royal Navy. The vast glass building was sub-divided into "decks" such as a Quarter Deck where the recruits mustered and Mess Decks for meals. Any time away from the "ship" was officially Shore Leave and they used the naval method of measuring time in "bells" (the number of bells signifying the subdivision of any given Watch). During Toby's time there he would also have had lectures on aircraft and engines which would have included stripping an engine down. I have added a page (see left menu) which includes some of the advice that the new recruits were given in order to give an insight into the nature of early flying and of the customs & sensibilities of the time. On the 24th August 1917 he was posted to RNAS Chingford where he would have a series of ground school lectures in aerodynamics, engines, navigation and meteorology. Following that the recruits would start initial flying training. Pilots would typically go solo after 3-4 hours of instruction and quickly progress onto cross-country flying. Around this time most pilots would pass their Royal Aero Club "ticket" but it seems that Yeulett was one of those that didn't actually take one. (Thanks, Ian Burns). The photo (left) is of Toby at Chingford in the cockpit of an Avro 504 looking, it has to be said, somewhat apprehensive! After Chingford the recruits would then go on to RNAS Cranwell for further training. Toby went on 13th October 1917 for more advanced flying training on aircraft such as the BE2c. During this period he would have received training in advanced navigation, aerial photography, use & maintenance of the Lewis gun and basic bomb-dropping. Bombing training initially started on the ground with a model landscape being dragged underneath him and then pulling a trigger at what he thought was the correct time to drop the bomb. After this they would progress to dropping dummy bombs from aircraft over the testing ground at Freiston. There would be further exams in these subjects prior to receiving a Royal Navy commission and passing out as a Flight Sub Lieutenant. Toby graduated at Cranwell on 28th November 1917 after a total of 32 hours flying. His graduation exam results were: Flying Ability - 1st Class; Aerial Engines - 60 (presumably out of 100? ); Navigation - 60; Gunnery - 62; W/T & Photography - 62. On graduation and promotion to Flight Sub Lieutenant he was posted back to Chingford for further flying and was at that time recommended for Deck Flying. On the 14th January 1918 Toby was posted to East Fortune to join the pilots of HMS Furious which was, at that time, in dock being modified. 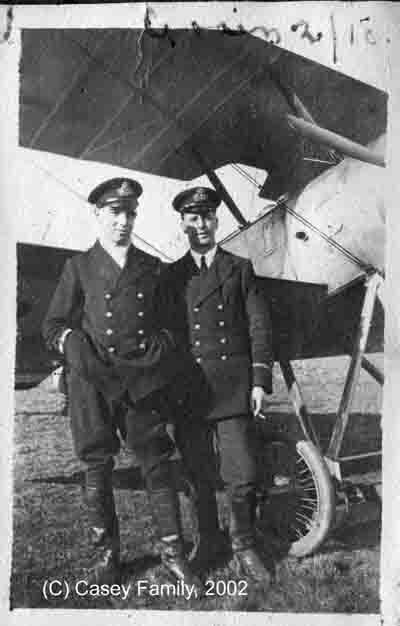 In February 1918 he was sent to the Marine Experimental Aircraft Depot at RNAS Isle of Grain in Kent (pictured right with Flight Sub Lieutenant GR Ashton) to partake in the trials of deck landing methods for use aboard the modified HMS Furious (see the relevant page via the menu). He returned to HMS Furious on 31st March 1918 having been reported as "progressing satisfactorily with deck landing training" on Sopwith Pups. In March 1918 the Royal Navy created The Grand Fleet Flying Squadron, the first formal association between seaplane carrying vessels, under Rear Admiral Phillimore. The impressively named Flying Squadron was a group of ships equipped to provide aerial support to the Grand Fleet's operations and was distinct from the fleet's other battle squadrons. It initially comprised HMS Furious with the seaplane carriers HMS Nairana, HMS Pegasus and HMS Campania plus they also had a defined group of pilots on which to draw. Toby joined Furious at the end of March and went to sea to undertake the trials of the landing deck concept throughout the Spring of 1918. On the 1st April 1918 the Royal Naval Air Service and the Royal Flying Corps were merged to form the Royal Air Force and Toby was promoted to Flight Lieutenant. The merger of the RNAS and RFC was extremely unpopular in the RNAS since they felt they were leaving the Senior Service to join a much more junior organisation that was modelled primarily on Army lines. The photograph left, recently found, is the best picture we have of Toby Yeulett. 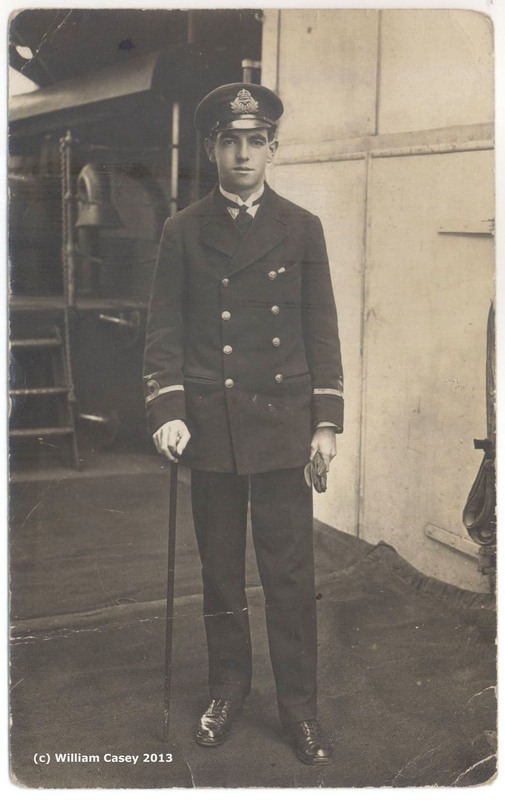 Clearly aboard ship and still in an RNAS Flight Sub Lieutenant's uniform we can assume that this was taken some time around March 1918 (prior to his RAF promotion in April 1918) and therefore almost certainly aboard HMS Furious. We don't have one photograph of him in a RAF Lieutenant's uniform so this is the last dateable photograph we have of Toby Yeulett. It's linked to a full size version which shows remarkable detail for the time. During Toby's early time on board Furious he was involved in flying sea patrols as well as undertaking test flying on and off the decks. 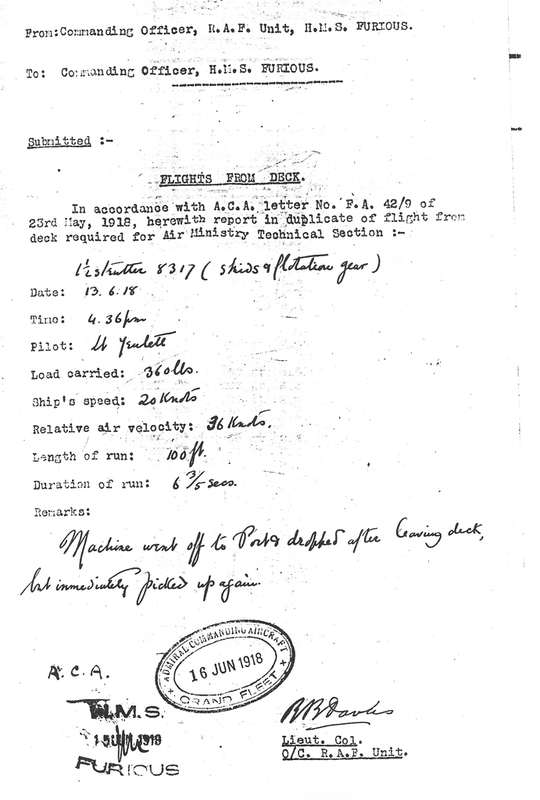 On 13th June 1918 he made a test flight off the deck of HMS Furious in a 1½ Skid Strutter as reported in this document written by Lieut. Col. Bell-Davies, Officer Commanding the RAF unit on Furious and one of the leading lights of aircraft carrier development. HMS Furious was a converted cruiser with the addition of a fore deck for take-offs and from March 1918 a landing deck at the rear of the superstructure. She was therefore the world's first aircraft carrier designed to both launch and recover aircraft aboard. After the testing of the landing deck concept at Grain the trials went to sea but once aboard ship the landings proved virtually impossible unless the ship was almost stationary (turbulance caused by the superstructure) and the idea was never used operationally. See the menu for a page about deck landing trials. In July 1918 HMS Furious launched the first ever bombing raid to be launched from an aircraft carrier, they attacked the Zeppelin Base at Tondern (now Tønder) and would prove significant in ways other than being the birth of the carrier as an offensive weapon. It was also to be Toby Yeulett's final mission and the one for which he was to be awarded his Distinguished Flying Cross. He was just 19 when he died.